One of the last Tupolev Tu-114 airliners has been sent to the scrapyard, leaving one of the fastest propeller aircraft in history with a mere handful of survivors. Flight Global has some photos and a brief article on the matter. It’s unfortunate the aircraft couldn’t be saved, as it truly is one of the great technological breakthroughs of aviation. What’s most amazing about the -114 is its performance. Based on the famous Tu-95 Bear bomber, it was one of the larger airliners of its day and could seat up to 220 passengers. It could reach 475 knots (880 km/h) and cruised at 415 knots (770 km/h) on the combined 60,000 shaft horsepower of its four gigantic Kuznetsov NK-12 turboprop engines. Maximum range was over 6,000 km, despite fuel burn figures that were probably marginal at best. That an airliner like this could be built in the late 1950s at a time when jet aircraft were viewed as the next best thing is remarkable. The reason I mention this is the new generation of airliners that is currently under development. Efficient aircraft result in lower costs, a huge incentive for airlines to upgrade. Over 600 sets of “blended winglets”:bw have been shipped for the Boeing 737, each saving over 100,000 gallons of fuel per year. 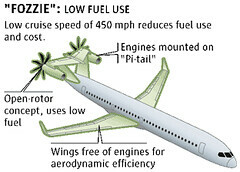 If one aerodynamic change can save a significant amount of fuel, imagine what entirely new aircraft will do. Even better, picture what a modern Tu-114 could do. Already extensive work has gone into propfan technology, basically the combination of a turboprop’s efficiency and turbofan’s high-speed performance. Modern composite materials could make the airframe strong, light, and aerodynamic. Bombardier’s Noise and Vibration Suppression system has made their Q series far more comfortable than past propeller-driven aircraft. Several of Boeing’s ‘Muppets’ designs, unveiled a few months ago, appear to incorporate this kind of technology. Turboprops have been experiencing something of a resurgence in sales lately - Airways had an article on Bombardier’s recent Dash 8 sales boom - with turboprop orders matching regional jets for the first time - and ATR has a much larger order backlog than usual. Rising fuel costs are making high-frequency turboprop service a profitable alternative to regional jets in the short-haul sector. How long will it be until the same is true of domestic flights? Will the 737’s equivalent, 20 years from now, be running on propfans?